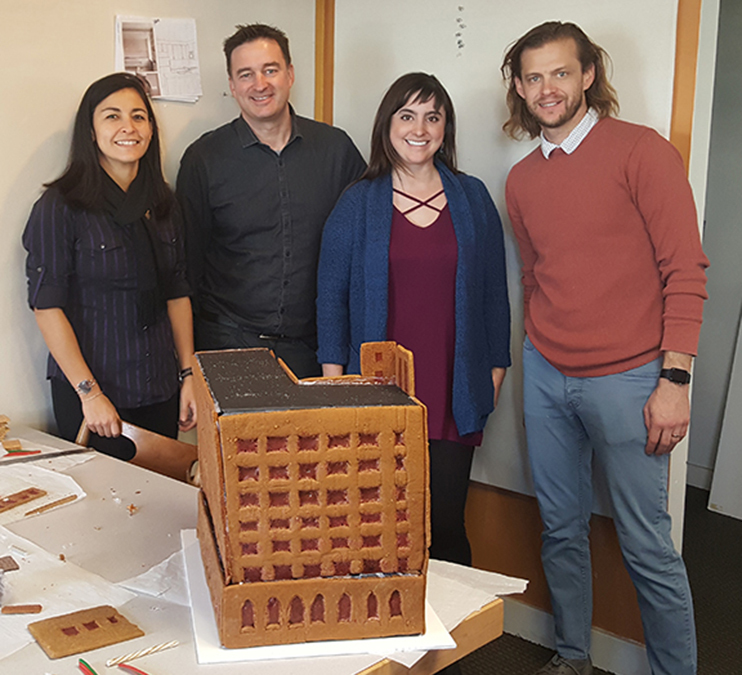 SMPC got into the holiday spirit and prepared an entry for the AIA New Mexico – Young Architects Forum Second Annual Gingerbread Haus Competition. 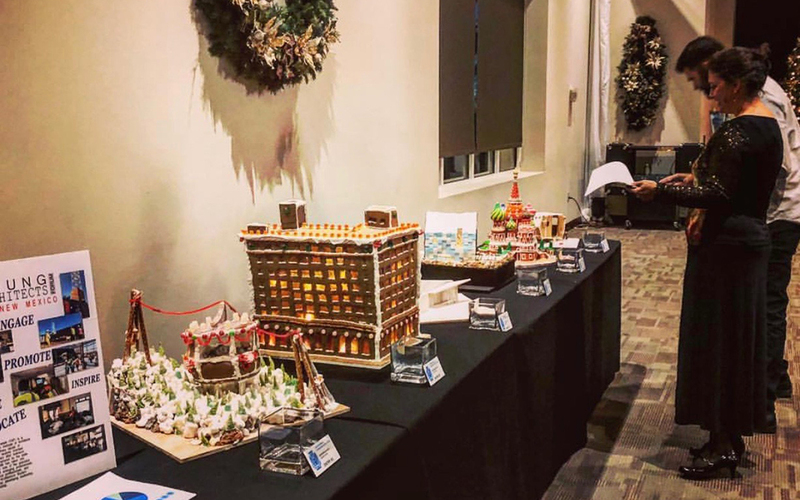 The entries are being judged were displayed at the 2017 AIA Albuquerque Annual Design Awards Banquet at the Canyon Club at Four Hills, Albuquerque. 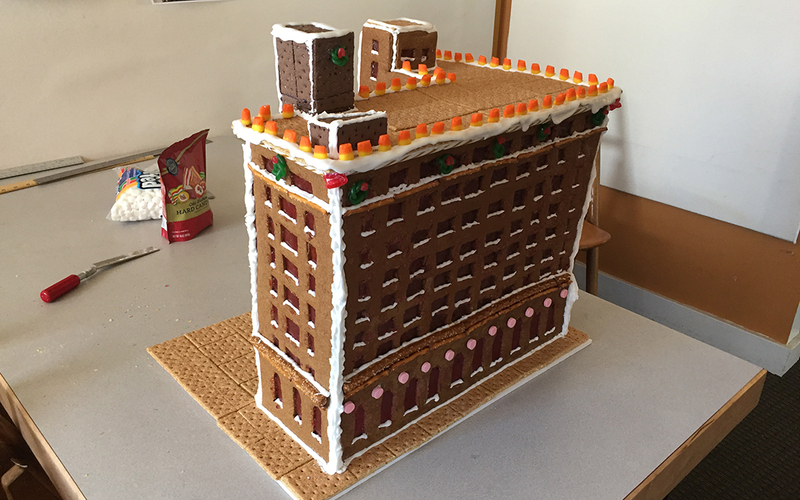 Entries were evaluated based on overall appearance, difficulty, creativity and originality, technique and skill. 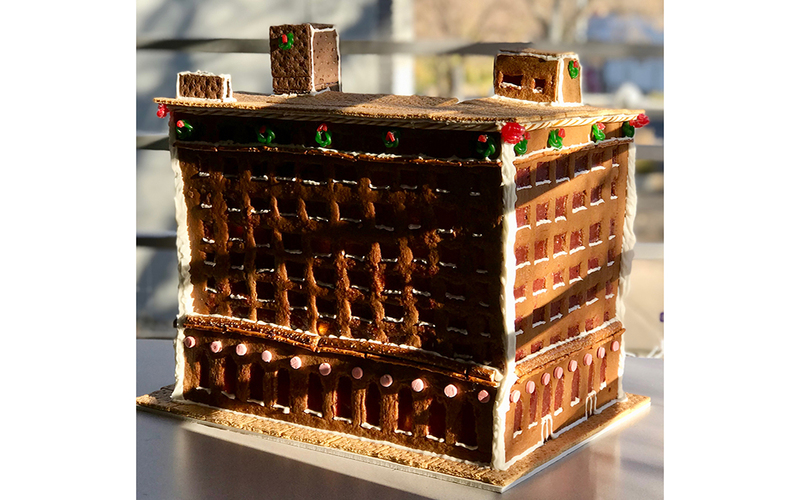 The SMPC gingerbread haus design was based on the Trost & Trost First National Bank Building we’re moving into early 2018. The actual building is located at 219 Central Avenue, downtown Albuquerque; it was placed on the National Register of Historic Places in 1979. 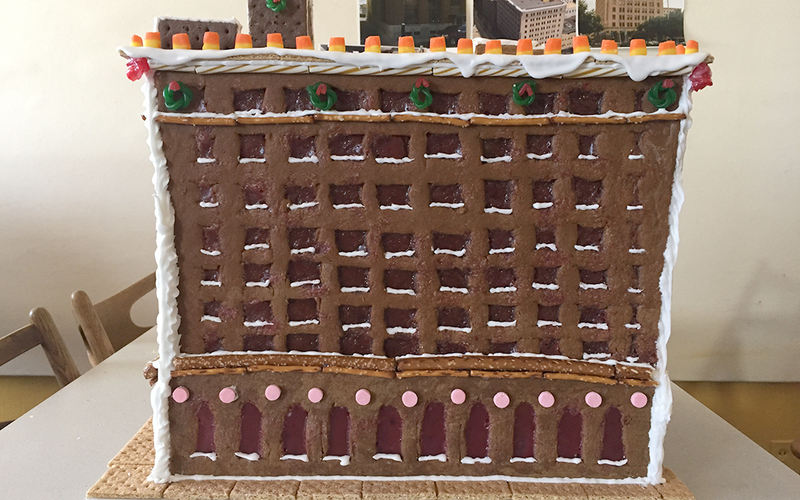 While our gingerbread version may not capture the stature of the 8-story, 1922 building, it smells delicious and we had a lot of fun putting it together. 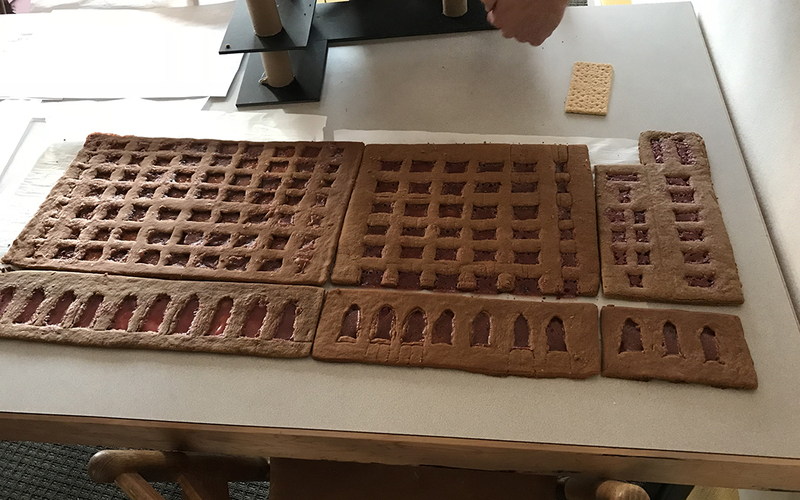 Sift flour, baking soda, salt, cinnamon, ginger, cloves, and nutmeg onto wax paper. Beat shortening with sugar until fluffy-light in a large bowl. Beat in molasses and egg. Stir in flour mixture to make a stiff dough. Chill several hours or overnight, until firm enough to roll. Arrange as many pattern pieces as possible on dough, allowing at least ½ inch between pieces; cut out pieces with a sharp knife. 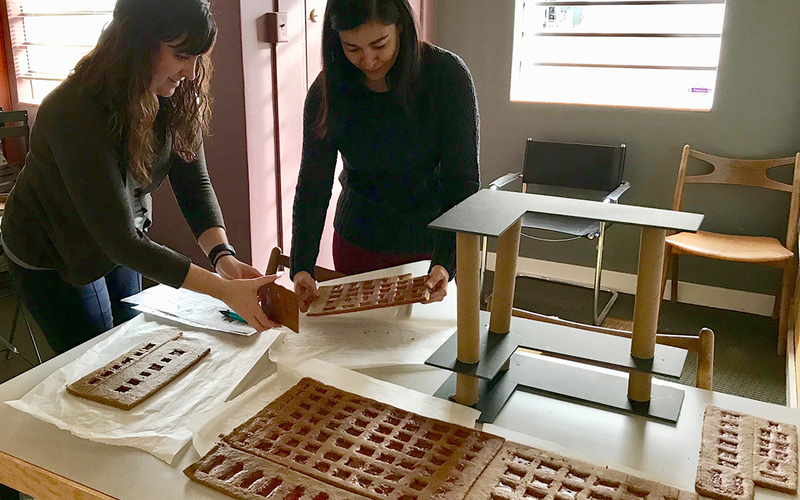 Carefully lift away all dough trims and save for re-rolls. Bake at 300° for 20 minutes, or until cookies feel firm to the touch. Remove cookie sheet from oven and trim any cookie edges that are not straight while cookies are still warm. Cool cookies on cookie sheet on a wire rack for 5 minutes, then slide off foil and cool completely. Beat egg whites and lemon juice until foamy in a medium-size bowl. Slowly beat in sugar, until frosting stands in firm peaks and is stiff enough to hold a sharp line when cut through with a knife. Keep frosting covered with damp paper towel and plastic wrap to keep from drying until ready to use. Spread 1 cup sugar in a small heavy skillet; heat slowly until sugar melts and starts to turn pale golden in color. Use immediately.